This Sunday 26th March 2017, join us on the beginners kayak route to try out sea kayaking! 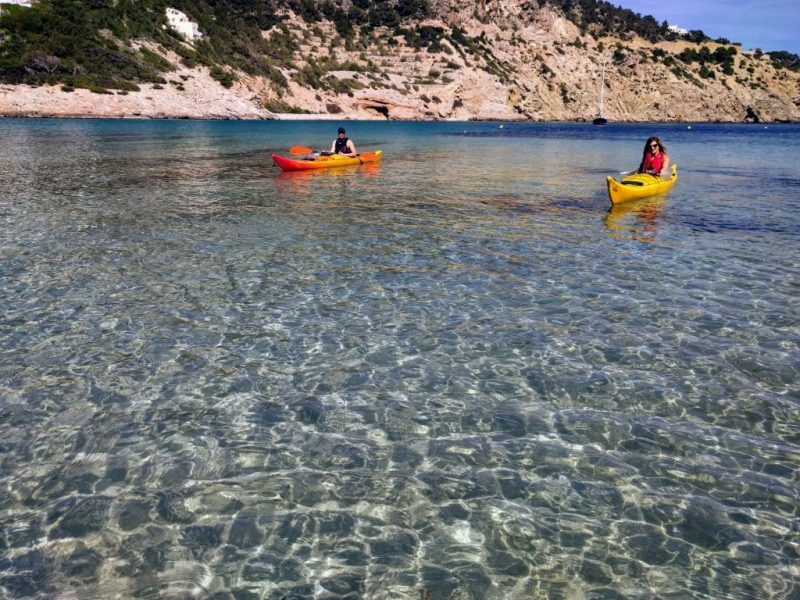 We’ll paddle gently towards Aguas Blancas in the north of Ibiza. A short route for those who’d like to come and learn/practice their skills! We’ll discover secret beaches that are only accessible via the sea, islands and a waterfall! 35€ or 20€ with our special ticket deal. We offer guided outdoor actvities with itineraries that help you to discover the unique side of Ibiza. We step into the culture, customs, flora and fauna of the island. Closed kayaks where you hardly get wet. Life vest. Sprayskirt. Waterproof bag to keep your things dry. We take tea and snacks during the stop that we have to rest. Qualified local instructors with extensive experience are with you throughout the activity. A raincoat may be useful to avoid splashes. Spare clothes just in case.